This kit is currently out of stock. The Sew Curvy Victoria Corset Kit is the closest alternative. A complete corset kit containing all the parts required to make the TV110 Corset by Truly Victorian. This corset is also based on an authentic historical pattern and when made up comes to a little above midbust. Easy to customise and with a great fit, this pattern is a popular choice. 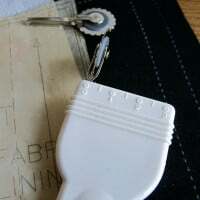 The corset pattern includes provision for an A, B, C or D cup and is a double-layer (lined) corset with instructions for the 'enclosed seam' method of construction - a method used by many professionals. This price of this kit gives you a saving of 5% on the total cost of the separate components. Kit contents cannot be substituted.